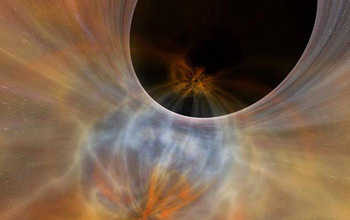 This film brings the current science of black holes to full dome planetarium theaters. This ultra-high resolution, cutting-edge production is narrated by the acclaimed actor Liam Neeson and supported by grants from the National Science Foundation and NASA's high-energy GLAST telescope project. Audiences will be dazzled with striking, immersive animations of the formation of the early universe, star birth and death, the collision of giant galaxies, and by a simulated flight into a supermassive black hole lurking at the center of our own Milky Way Galaxy. The program was produced by the Denver Museum of Nature & Science in association with the National Center for Supercomputing Applications, and directed by Thomas Lucas.